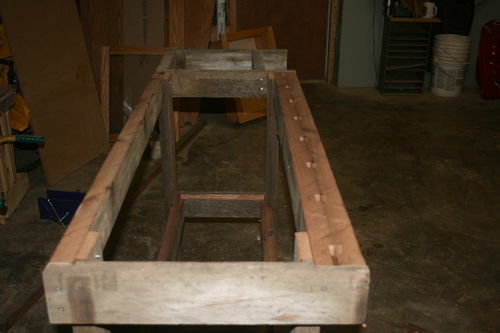 In the last blog I covered the initial cutting and assembly of the New Yankee Workshop workbench frame. This blog is all about the bench dog assembly. If the bench is the project I am the most excited about building, the bench dog assembly is the part of the bench I was the most excited to start building. I’ve recently started using my hand planes more often (love it!) 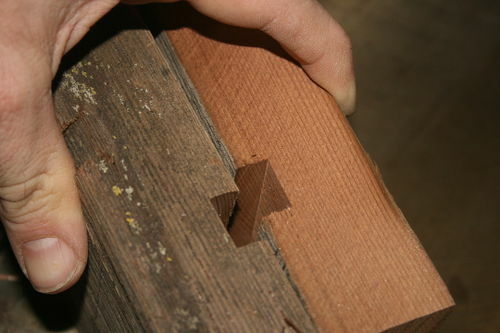 but fight with how to adequately hold material flat so that I can plane the surface flat. 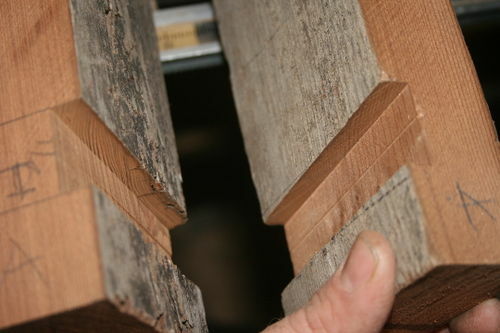 Usually I have to clamp the work piece to my existing “bench” – an old exterior door attached to a 2×4 frame – plane part and then rearrange the clamps so that I can plane the rest of the work piece. The bench dog assembly will allow me to clamp work pieces flat to the table, with the dogs below the work piece so I can plane/sand/scrape/route the entire surface without rearranging clamps. Like the rest of the bench, I decided to build the first draft of the bench dog assembly out of the “2×4’s” I ripped down from old deck wood. I’m glad I did it this way, it was a good learning experience…you’ll see why in a minute. The plans in the book have the bench dog assembly running most of the length of the top. Each bench dog slot is angled at 4 degrees off 90. This provides the holding power when you crank down the work piece. 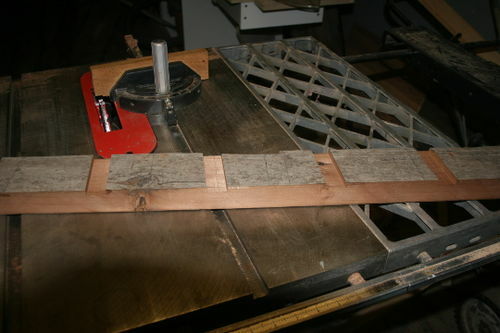 In the book/show Norm uses a radial arm saw to make all of the bench dog cuts. As I’ve already mentioned, I don’t have one, and as cool as they are, don’t really have room to pick one up – even though there are a trillion of them on Craigslist for next to nothing. Instead I used the table saw, miter gauge, and dado blade to make the cuts. In order to get my 4 degree setting for the miter gauge I decided to cut a “template” out of some scrap stock on the miter saw. 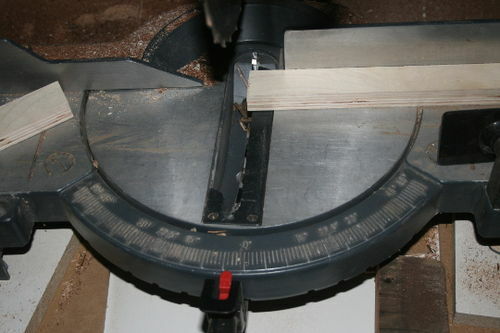 Using a thin piece of plywood cut off I angled the saw to a 4 degree cut and made a quick cut. 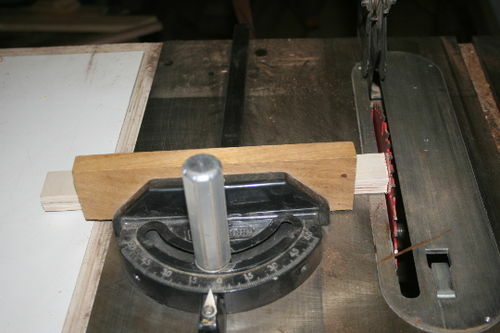 Then I used the template to get my miter gauge set close to 4 degrees off 90 (86 degrees). With the miter gauge set up I made a few quick test cuts to get a feel for how the cut would work. Each slot is 1” wide, and they are spaced 6” apart. All of the layout work had already been done in the first part of the project, so it was just a matter of setting up for each cut. I set the dado blade to 1/2” so that I could cut everything in 2 (ish) passes. There were a few that I had to sneak up on the line – but like everyone says, it’s easy to remove more stock it’s hard to put it back. Everything looked good on the test cuts so I went to town on the first side. Then I grabbed the second half and flipped it over, and started making cuts. Whoops! I lined it up after the first cut and realized that the slots didn’t line up, they were actually going in opposite directions. WTF? It took me a few minutes of head scratching to realize that I had to flip my “template over” and set my miter gauge to 4 degrees off 90 in the other direction. I made a few test cuts in my now scrap “2×4” to make sure it would line up correctly. At this point I had to set the miter gauge aside, pull the dado blade off, and cut a new “2×4”. This only set me back a little, but it was a silly mistake that wasted shop time. Replace and re-set up everything, made the cuts and ended up with this! Using a cut off that was the right size for alignment, I added some glue to the inside faces, clamped up the bench dog assembly, and screwed everything together with 2.5” screws. I took the whole assembly over to the bench frame and fitted it into the slots that were cut during the framing stage. I still need to add a top, and will need create another bench dog assembly for the vice end plus creating the bench dogs themselves. I decided to buy a woodworking vice from harbor freight as opposed to a Bench screw, but the decision was made after the frame was cut and assembled. It’s a different size, so I will be making some design modifications to accommodate the larger width vice. 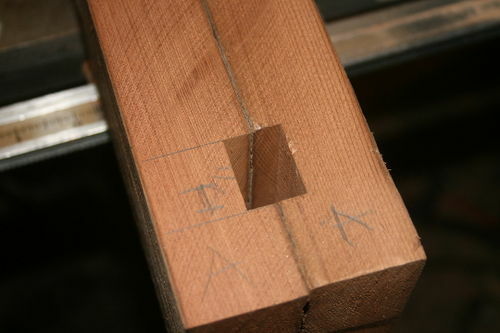 In the next blog I’ll show how I cut the slot in the top – the scariest part of the process so far. 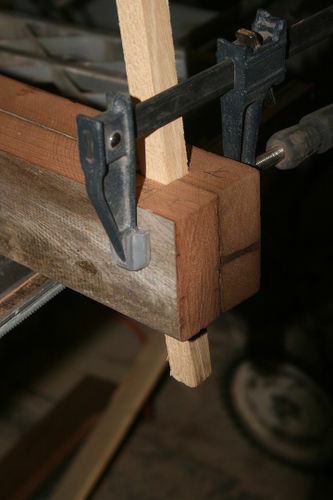 How it gets attached to the bench, and my design modifications for the frame to accommodate the vice. I see that you have a miter saw. My DeWalt miter saw has a depth stop that keeps the saw from lowering all the way down. This allows me to make a cut only partially through the work piece. 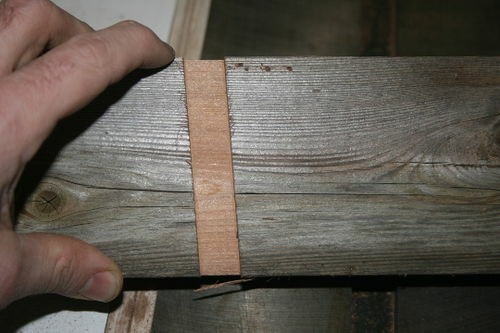 If your saw supports this it might be safer than trying to move long pieces through the table saw. Jesse – Thanks for the tip. I wish mine had a depth stop but it’s a pretty basic chop saw style. Down the road when I have some more funds I’d like to get a slider with a depth stop. I totally agree, it would be safer than long pieces on the table saw. Seems to me you’ve got a lot done quite quickly. Nice dog assembly! I looked at the Amazon reviews for your book – you might want to as well, there were some interesting comments. You must be pretty excited as your bench takes shape. Thanks for your comments etc on my stuff too! Looks like a good start on your bench. 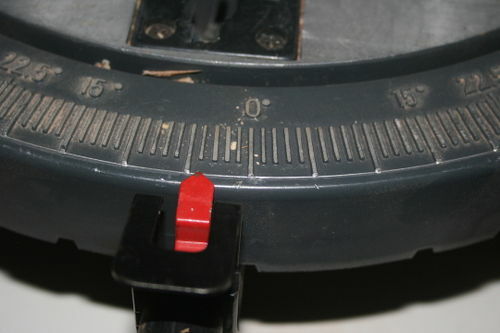 And a nice solution to setting the angle on the miter gauge. I did a blog a month ago on setting an angle with a framing square. It might help you in the future. Going to be a nice bench!